Place the roast in a shallow roasting pan. Mix together the mustard and 2 tablespoons of brown sugar; spread over the roast. Roast for 3 hours in the preheated oven, basting with 1/4 cup of apple juice every 30 minutes. Roast is done when the internal temperature reads 145 degrees F (63 degrees C). During the last hour the roast is cooking, combine the prunes, apricots, red wine, 1/4 cup brown sugar, 3/4 cup of the juices from the roasting pan, and cloves in a saucepan over medium heat. Bring to a boil, then cover and simmer for 15 minutes. Spoon the fruit around the roast in the roasting pan during the last 30 minutes of cooking. When the roast is done, place it onto a serving platter and spoon the fruit around it. Remove 1/4 cup of the drippings from the roasting pan, and mix with the cornstarch. Stir into the pan of drippings, and cook over medium-high heat, stirring gently until thickened and no longer cloudy, about 5 minutes. Transfer to a gravy boat or serving bowl. Slice the roast, and pass the sauce for guests to serve themselves. 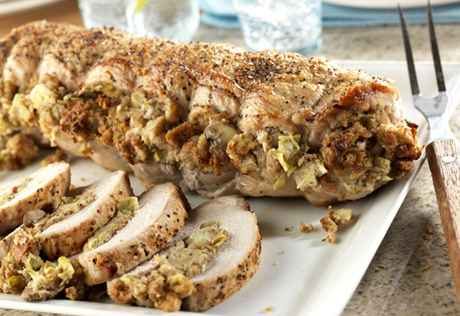 No comments for: "Elegant Pork Loin Roast Recipe"